I’ll admit it’s not been a great year for me. To put it plainly, I was sick most of the year with bouts of nausea that turned out to be the result of an out-of-control ovarian mass. Taken care of…a week before one of the busiest Septembers of my life. In fact, I write this on August 25, two days after surgery. 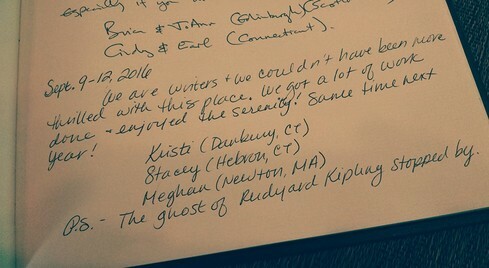 I’m dreaming of Thursday, September 7, when I’ll be leaving to go up to Rudyard Kipling’s Carriage House in Dummerston, Vermont, for a much-needed writing retreat with my friends Meghan and Stacey. Although it says it “sleeps four,” we really feel that it more comfortably sleeps three, as one of the rooms has an old-fashioned full-sized bed (which is really close quarters for two people to sleep on). There is ample room in the living room, I suppose, to throw down an air mattress, but the couches aren’t something you really want to sleep on, either. Last year, Meghan had to unexpectedly cut her stay short by one day, leaving me and Stacey in the house alone for the last night. Posted on September 7, 2017, in Deep Thoughts & Fun Stuff, The Writing Life and tagged ghosts of writers, good places for writing retreats in Vermont, Landmark Trust Properties, Rudyard Kipling, Stacey Longo. Bookmark the permalink. Leave a comment.